Update your home with this modern upholstered arm chair and ottoman set. Flared arms and tufted cushions offer a fresh look, while comfortable seating and durable construction ensure that this chair will be a family favorite. The matching ottoman features the same clean and modern look, adding another touch of comfort to your home. These pieces are made in America. The 1260 Contemporary Upholstered Arm Chair and Ottoman by McCreary Modern at AHFA in the area. Product availability may vary. Contact us for the most current availability on this product. 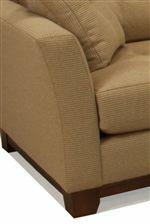 1260-OA Ottoman 1 24" 31" 17"
1260-CA Chair 1 45" 41" 33"